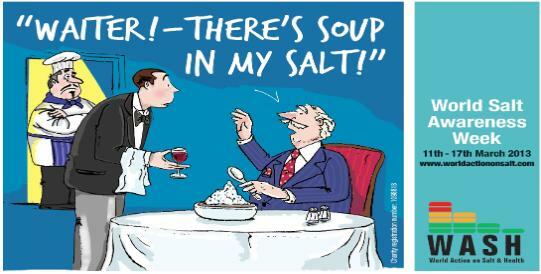 WASH will be holding it's 6th World Salt Awareness Week on Monday 11th – Sunday 17th March 2013. We will be asking for ‘Less Salt Please’, showing how everybody, including chefs, can use less salt and still enjoy the great flavour of their food. In this years National Salt Awareness Week, we showed you how to take control of the salt in your own food preparation, by simply using less salty and more tasty ingredients, as well as adding less salt during cooking and at the table. We highlighted to the catering industry, chefs and others involved, the importance of adding less salt to our food and the long-term health implications of eating a high salt diet. Twenty two countries took part in the 6th annual Salt Awareness Week, including Australia, Pakistan, Poland, Iran, the Pan American Health Organisation, Italy and Lebanon.